Observers will not participate bu get the printed material. Learn the art of creating shapes, logos*, letters and other designs using buttercream and hand-made stencils. This technique I created 25 years ago will allow you to create the clean lines of letters, shapes, logos, graphic designs, etc. without using heavy layers of fondant. Color matching is achievable such that people can’t tell if it’s a cake or printed picture. Everyone will go home with an 8”cake they decorated using this technique. To see examples of the technique, check out my (old) website’s Look-a-like cakes gallery starting at http://www.cafe-arc-de-larctique.com/lookalike2.htm (click the right arrow to see the rest of the pages). Not all the cakes shown required stencils but most of them did. 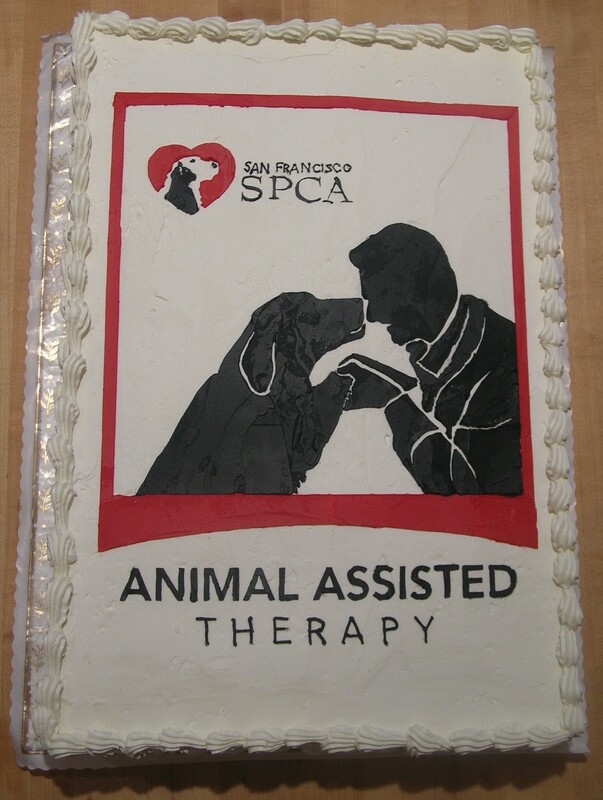 In addition, here is a logo from the SF SPCA I created on a cake for them. SOLD OUT $60 includes Recipes, Printed directions and verbal training plus the cake they will decorate and take home. $25 Observers will get the printed material. *Issues with when you can and can’t use registered logos/pictures will be discussed during the workshop.